Doc Watson is one of the true pioneers and legends of bluegrass music. As a lover of many types of music, it was an honor for Dr. Gustavson to use my image taken at The Paramount Theater in Charlottesville, Virginia as the cover photograph for this book. 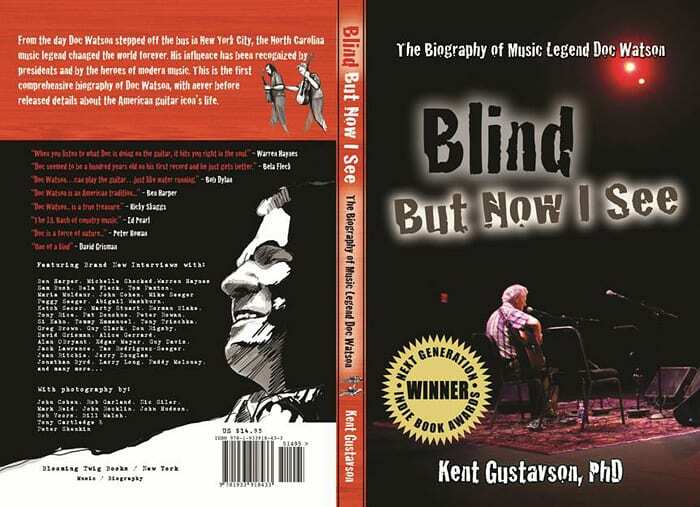 Blind But Now I See: The Biography of Music Legend Doc Watson is the winner of the Best Biography of 2010 from the Next Generation Indie Book Awards, and a Finalist for 2010 Foreword Book of the Year in the Biography category. From the day he stepped off the bus in New York City, Doc Watson changed the music world forever. His influence has been recognized by presidents and by the heroes of modern music. This is the first comprehensive biography of bluegrass great hero, flat-picking legend, and the man who brought Amazing Grace into the public consciousness. Inspiration to Robert Plant, Bob Dylan and countless other rock, country, pop and bluegrass musicians, Doc Watson started his career in his late 30s, on a small stage in Greenwich Village, New York City. Blind But Now I See delves into the dark corners of Doc Watson’s life, and of course, the development of his baritone voice and steady guitar licks. This is a full and honest portrayal of a true American hero, and a genius of our times, from the small town of Deep Gap, North Carolina.Blind But Now I See: The Biography of Music Legend Doc Watson includes never before released details about Doc Watsons life and music career. Chock-full of new and compelling interviews. Among others interviewed are: Abigail Washburn, Alan O Bryant, Alice Gerrard, Annie Bird, B. Townes, Bela Fleck, Ben Harper, Beppe Gambetta, Clint Howard, Darol Anger, David Grisman, David Moultrup, Don Rigsby, Donna Hill, Ed Pearl, Edgar Meyer, Ellen Harper-Verdries, George McCeney, Greg Brown, Guy Clark, Guy Davis, Jack Lawrence, James Reams, Jean Ritchie, Jerry Douglas, Joe Crookston, John Cohen, John Pushkin, Jonathan Byrd, Ketch Secor, Larry Long, Maria Muldaur, Mark Moss, Marty Stuart, Michelle Shocked, Mike Marshall, Mike Seeger, Norman Blake, Paddy Moloney, Pat Donohue, Paul Asbell, Paul Chasman, Peggy Seeger, Peter Rowan, Peter Siegel, Rebecca Lovell, Ricky Skaggs, Roland White, Sam Bush, Sarah Bryan, Si Kahn, Tao Rodriguez-Seeger, Tom Chapin, Tom Moore, Tom Paxton, Tommy Emmanuel, Tommy Sands, Tony Cartledge, Tony Rice, Tony Trischka, Warren Haynes and Wayne Henderson.